The Billing module offers a range of functions and tools that were made with an emphasis on simplicity, intuitive work and productivity. You should be able to not only create and manage your bills, you will also see how the time you track in the TIME TRACKING module flows and transforms itself into money when managing your billing process. 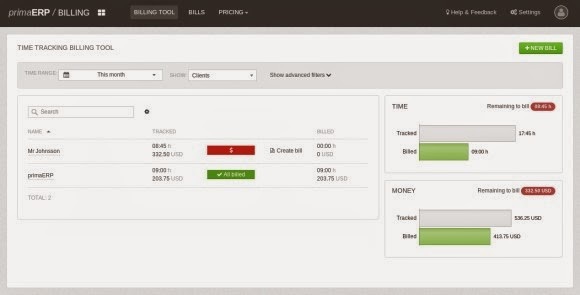 The Billing dashboard is the first thing you’ll see when starting the billing module. It’s convenient and the key to help you see your time structured according to its tracked and billed status. You can easily filter the time you’re interested in and have a quick feedback on how you’re doing from a project or client point of view. There’s a wide range of questions you can cover as well, for example: How much time did I track last month? Do I have any time left over? How much can I potentially bill on this one? Taking a closer look at a zoomed version of the previous screenshot, you can confirm that although you’ve billed all your time for your client primaERP, you still have 08:45 hrs left to bill for Mr Johnsson. You can also quickly see how much money you’ll make and if you feel that it’s time to create a bill, there’s nothing easier and more comfortable than hitting the “Create bill” button and making your bill based on the data you’ve filtered via the Billing Tool. The graphs on the right will always show you the aggregated data based on the setup of your filters. Working with the Billing Tool not only gives you a straightforward and clear overview of the way your time is structured from a billed status point of view, it also offers a fast and clever way of creating new bills and managing your billing process. Analyzing your time and billing is very intuitive and can be done in a breeze. Don’t hesitate and give it a try. We believe you’ll value our work.